CHOOSE the COLOUR and QUANTITY you require in the drop-down box above (SAVE with Multipacks)!! 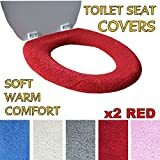 This fantastic super-soft, super-warm Toilet Seat Cover is the perfect answer to the cold-seat winter blues. Cleverly designed to fit over any toilet seat. Very easy to fit and remove. Attractively packaged to make a thoughtful gift for young and old alike. Premium hard-wearing design with metal retaining ring ensures a snug and neat fit onto your toilet seat, beware elastic band style alternatives. Size 32cm diameter. The Fantastic WARM FLEECE TOILET SEAT COVER. The great way to stay warm and comfortable all year round – not just for winter! – High quality super-soft fleece will help help eliminate soreness and discomfort everytime you use the loo..
– Cleverly designed to fit over any toilet seat . Very easy to fit and remove! – Made from a soft fleece in Cream or Red (choose above) to compliment your toilets decor. – It’s the Perfect Solution to an age old problem! – Material – 90% Acrylic, 10% Polyester. – Size: 32cm diameter, Machine Washable at warm setting, drip-dry. IMMEDIATELY KEEPS YOUR FEET TOASTY AND WARM: this super soft, cosy faux-fur foot pouch will keep your feet and ankles warm and snug. Absolute bliss and fantastic for those foot freezing days and nights. Ideal for when you’re sat at the computer or on the sofa relaxing, watching TV or knitting. JUST THE TRICK FOR COLD FEET OR POOR CIRCULATION:If you suffer from poor circulation, arthritis or cold feet, then suffer no more! Enjoy some comfort as your feet are enveloped by this super soft, snug, giant slipper! SAFE AND EFFECTIVE: Don’t waste your time or money on costly ineffective electric foot warmers that take ages to warm up, or a microwave foot warmer that can get too hot or need to be constantly re-heated. Just pop your feet in Snug N Boot® natural foot warmer and feel the warmth immediately. Snug N Boot© foot warmer carries NO RISK of burning or overheating. MAKES THE PERFECT GIFT FOR LOVED ONES: Snug N Boot® foot warmer is a popular gift for parents and partners, and especially for mums everywhere! Whether it’s for a birthday, Christmas or any other occasion, show someone you care! Suitable for shoe size up to size 8. MONEY BACK GUARANTEE: We are confident that you will experience warm toasty toes with Snug N Boot© foot warmer or your money back guaranteed. Say goodbye to cold feet and hello to warm toasty toes – Naturally! Banish the curse of cold feet once and for all! 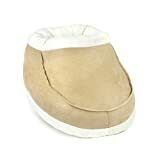 Keep your feet warm and cosy with this super Snug N Boot® foot warmer from Home and More Store. Whether you’re sat reading a book, watching TV or in a draughty office working at the computer, slip your feet into this cosy oversized slipper and keep the chills at bay as the temperature drops. Made from 100% polyester faux-fur for long lasting comfort, our foot warmers are suitable for shoe size up to size 8. Snug N Boot ® foot warmer is made from 100% polyester and is machine washable so can be kept clean and odor free. Get cosy today and Add to Cart Now!